Peter Evison on the ball. 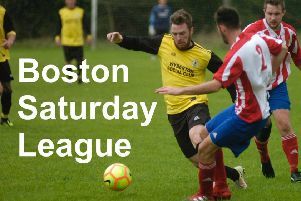 It felt like a victory, even though it was only one point gained against title chasing Hallam FC. Relegation-threatened Skegness Town had been given little hope of halting the South Yorkshire side’s charge towards the title. But a battling performance by the seasiders saw them share the spoils. Continuing their work ethic from the previous week, Town battled for every ball, denying one of the division’s highest scorers room to impose themselves on this fixture. And the longer the game remained goalless, the more the visitors demonstrated their frustration, desperate not to allow their title ambitions to suffer a dent. The first half produced few chances. Hallam’s best effort came from the boot of Micah Bishop, whose shot was heading for the top corner only to be tipped over by the hand of home keeper James Lambley. The diving save had the crowd of 150-plus on their feet while Bishop couldn’t believe he hadn’t put his side in front. Lambley also did well to deny visiting hotshot Kieran Watson and Bishop on another occasion. At the other end the best chance fell to Will Britton who stung the fingers of Andrew Sneath in the Hallam goal. Watson had appeared to have broken the deadlock just before the hour when he rose at the far post to head in off the underside of the bar. But the ‘goal’ was ruled out for offside - a let off for the seasiders. Skegness captain Richard Ford led by example with a string of meaty tackles. Pete Evison and Ben Sibbick followed his lead to protect the point. But with 20 minutes left the visitors made a vital breakthrough. The ball fell to Bishop on the edge of the Skegness penalty area and he shot through a crowd of players into Lambley’s left-hand bottom corner. Substitute Tom Sawyer was immediately introduced to the contest, followed shortly afterwards by George Hobbins and Jordan Smith. Enter Gary King, who called on his years of experience to find the equaliser in the 81st minute. A free kick 10 yards inside the Skegness half was lofted into the danger area. Bailey Forth leapt to head on and King did the rest. He controlled the ball and fired goalwards. His first effort was blocked on the line, but he had the presence of mind to follow up and made no mistake from six yards. Hallam pushed more men forward in an attempt to regain the lead, but Ryan Carroll blazed their best chance over the bar. At the other end Town could have snatched all three points in the last minute had Josh Morrall chosen to shoot when Sneath’s poor clearance fell at his feet. TOWN: J. Lambley, Warren, Norburn, L. Lambley, Forth, Ford, Sibbick, Evison, King, Britton, Morrall, Sawyer, Hobbins, Clarke, Nichols, Smith.